It’s that time of year again; time to head shallow for largemouth. Shad start to move shallow in late summer and the big bass will be right behind them. There are three ways that always seem to produce for me this time of year; fishing docks, flipping laydowns and fishing a topwater near grass. Let’s flesh these out. This is a great way to find late summer largemouth, but not just any dock will do. I like to focus on the deeper docks that are closer to the main lake and not the ones that are way back in a creek. There are several different baits that will work when fishing deeper docks, but I like to skip a ChatterBait with Yamamoto Zako as a trailer. This combo is really easy to skip and the best colors for me are anything that resembles a shad. You also can’t forget the best dock skipping bait on the planet, a wacky-rigged Senko. Different types of docks require different approaches in my opinion. For the floating docks I like to get the bait as close as I can to the floats and for the standing docks with pilings, I try to get as close to the pilings as possible and even try to bang the lure into the pilings for a reaction bite. Another one of my favorite ways to target largemouth this time of year is by flipping and pitching wood. Since many lakes draw down this time of year, finding wood with enough water around them can be a challenge. The positive to finding wood when there isn’t much left in the water means it is almost a guarantee that a bass will be there. When there are only a few pieces of wood left, you can almost call your shot and catch one every time. Usually, this approach is best when you run up the lake to the river. These areas usually have much more cover in the water and dingy water that sets up perfectly for pitching and flipping. When it comes to baits to use, there are several that will work, but my favorite is a ¾ oz. jig with a 5” Yamamoto Double Tail as a trailer. I really like the double tail because it can imitate a shad, bluegill or crawfish just by changing the color you use. It also helps slow the fall of that big jig. The final technique that I like this time of year is fishing grass with a topwater frog or walking bait along the grass line. The thing about fishing grass is that you usually need to work quickly until you find active fish. There may be miles of grass and the fish are grouped up in small areas. 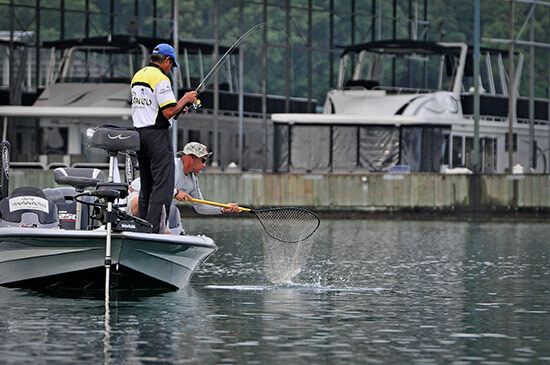 Once you find some fish, a good approach is to slow down and pick apart the area. I like to use a Texas-rigged Senko with no weight and cast into the holes in the grass. The D-Shad is another great bait and it has the same great fall as the Senko as it shimmies down. You can fish it like this or twitch it over scattered grass. There really isn’t a wrong way to fish it. I like to key on main lake grass or grass that is right at the mouth of a creek. Hydrilla and milfoil are usually both good this time of year, but as it moves to later in the year the bass seem to prefer one over the other and it sometimes takes some searching to find the right type of grass. Late summer is one of my favorite times of year to fish for largemouth. They are often in predictable locations, grouped up and hungry which can lead to some great days on the water.